When you want exceptional cooking capabilities, you need exceptional cookware. Kitchen Charm of Canada has been providing North America with premium kitchen cookware and accessories for over three decades. More than just a cookware company, Kitchen Charm offers an extensive selection of culinary trimmings and trappings for a superlative meal from start to finish. From induction cooktops and slow cooker bases to bakeware and serving utensils, Kitchen Charm can help you outfit your kitchen with everything that’s necessary to impress your guests. Kitchen Charm cookware is one of the nation’s most effective virtually oil- and water-free kitchen products. Each piece works just as hard as you do to ensure your family receives the healthiest food, cooked just right, and packed with flavor and nutrients. Impact bonded steel construction means Kitchen Charm pots, pans, and Dutch ovens distribute heat more evenly than visually-similar cookware found on store shelves. An exclusive lid-based alert system will let you know when your food is at the optimum heat level so you can turn the burner down or off and know that your fruits, vegetables, and meats will finish cooking in their own juices to lock in flavor and nutrients. In addition to its exceptional cookware, Kitchen Charm offers a functional line of water filtration products to ensure food is cooked just right and without added contaminants. The FrescapureTM 5500 is a carbon activated filter to reduce chlorine taste and odor. Additionally it reduces 99% of lead and cysts that may be present in the water. By removing this, Kitchen Charm customers drink and dine knowing their water is 99% bacteria and virus-free. Kitchen Charm of Canada makes learning how to cook fun and easy by offering a plethora of pre-scheduled cooking demonstrations throughout each province. These hands-on shows offer home-cooking hopefuls the opportunity to view Kitchen Charm cookware in action and to taste many of the company’s exclusive recipes. Kitchen Charm is so sure of the quality and functionality of its products that we offer a 50 year guarantee along with a number of free gifts for attendees. Each year, Kitchen Charm sponsors the Kitchen Charm Dream Honeymoon Sweepstakes, where lucky newlyweds can win a weeklong honeymoon at an adult-only all-inclusive resort including airfare and select excursions. 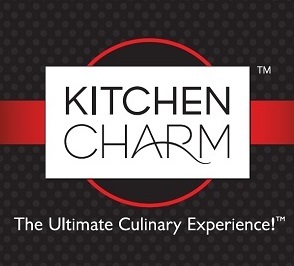 Kitchen Charm supports the community through sponsorship of a number of local charities including the Wounded Warrior Amputee Softball Team, and nationally via large cash donations to Feed the Children.